When you throw a party, you want everything to be perfect - especially the food. You want your guests to be impressed by not only the quality, but by the presentation, and ample portions. That's why you should call Le Petit Gourmet for your next party or special event. We specialize in catering for all that flatters the palate. With delectable hors d'oeuvres like Smoked Trout Mousse on Cucumber Rounds or Petite Blackened Beef Tenderloin on a Curstini. Choose from an original collection of salads, barbecue, buffet, or individual entrees that will fit any occasion. Just think of how much easier your holiday get togethers could be with the help of a professional caterer. 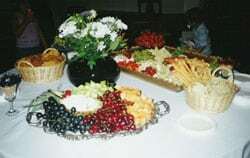 Any size party from 2 to 2,000 will be catered beyond your expectations. Call us today and lift your next party to a new level. 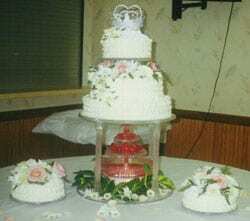 Le Petit Catering is Chef Owned, and we have more than 27 years of catering experience. 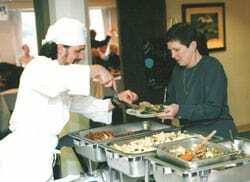 Owner Norm Grammer worked at the Vermont Culinary School for 8 years before starting his own catering business in 1996.